Stephen Crawford a 3rd generation farmer and his father William, own and operate a dairy farm near Gracehill in Co. Antrim. Stephen came home to the farm, helping to milk 65 cows and farm 140 acres, after attending CAFRE at Greenmount a little over 20 years ago. Today, milking 220 cows and farming nearly 250 acres, Stephen enjoys the challenge of progressing the farm while focusing on improving the herd and the land. Stephen knows the value of reseeding his grass swards to maintain the high quality forages that he feeds to his high yielding dairy cows. “I inspect the fields each year and determine which are suitable for turning over and sowing back to grass, and which should go into wheat for a year or two before being sown out to grass” explained Stephen. “I farm a rotation that includes 200 acres of grass and 50 acres of wheat split between winter and spring varieties which I feed as whole-crop forage along with the grass through the diet feeder” Stephen Continued. 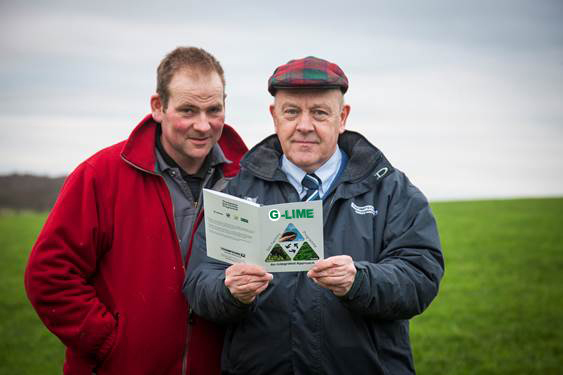 “Customers who soil test to monitor soil health and use G-Lime to improve and maintain soil pH, consistently see improved grass yield and quality, better response to applied fertiliser, greater ryegrass and clover persistence as well as an improvement in soil structure - resulting in better drainage” Basil said. G-Lime is available in Bulk, 600kg toplift bags, 4x500kg quad packs and 30 x 50kg bags. Contact Kilwaughter Lime on 028 2826 2132 for more details.